The particular emphasis on family and its happiness and unhappiness in the very opening line of Anna Karenina lays bare Leo Tolstoy’s intention of creating a magnum opus based on probably the smallest, yet the most important unit of society, called FAMILY. As I picked up Anna Karenina, supposedly the first attempt at novel form by Tolstoy, comprising of more than 800 pages, divided into two volumes and eight parts, I had an inkling that for at least a month, I am going to live in a world very different from my routine life. As when I read Crime and Punishment, I was gloomy for a few days, so I expected Anna Karenina to depress me even more, as I was tricked by the opening statement, considering the novel to be a steady stream of broken hearts, jealous intrigues and infidel treacheries. However, to my utter surprise the first part of the novel brought a smile on my face. Anna Karenina had much more to offer than just sufferings, it has humor, irony, wit and a curious mix of tragedy with comedy. In stark contrast to War and Peace, where a death scene was placed at the very beginning, in Anna Karenina, the initial few pages are written in a lighter, almost comic vein by the author. 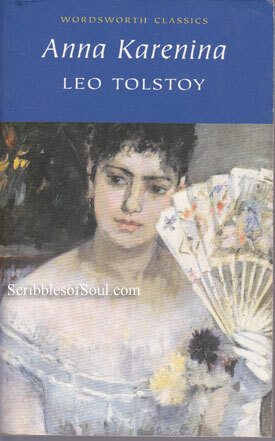 Though, the beginning depicts a domestic quarrel, Tolstoy successfully portrays the event to be just a foil for a much more interesting plot that would primarily feature Levin, Anna, Kitty and Vronsky. All of these characters are unique in their own ways and they are connected in a peculiar manner by Leo’s loosely woven mesh of human emotions, sympathies and love. There are several plots in the novel and ultimately each plot and character falls in its allotted place. The novel is named after Anna Karenina, a married noble woman, living in Petersburg with her husband Count Karenin. Anna is Oblonsky’s sister and comes to Moscow to act as a mediator and save her brother’s marriage. However, as luck would have it, she herself falls in love with another man and loses her status in society by becoming a mistress, leaving her husband and son. Will she be able to severe her connections and yet live happily with the man of her dreams is one of the main plots of this novel. But, it will be wrong to say that the story revolves around Anna, as it is the first novel, where the Heroine is dead even before the novel ended, and the story is still carried forward without her presence. As I said before, there are at least three stories that run parallel in Anna Karenina. It is a story of paradoxes and likewise the characters juxtapose each other in the most unexpected ways. One of the main character of the novel, that really impressed me is Levin, who is highly moralistic though impractical. He wishes to work for the welfare of peasants and yet wants to earn enough money out of farming and lead a luxurious life. Despite being illogical and confused, I think Levin is the only male protagonist, who was ever so much highlighted in a woman centric novel. Most of the best written episodes, be it the gaily captured marriage of Levin, the exciting hunting scenes, the tragic death scene of a sick brother or the pathetic confusion of an expectant father, revolve around Levin. He comes forth as a literary adaptation of Leo Tolstoy, and is even made the Hero in the last part of the novel, as the Heroine had already died. Another character that deserves a mention is Kitty. She is a regular young girl, who is impressed with Levin’s chivalry, but is floored by the charm of a handsome, socially adept military man Vronsky. She rejects Levin for Vronsky and is ready to embark on an adventurous Ball to dance with the dashing man of her dreams. But, Vronsky is enamored by the celestial beauty of Anna Karenina and unluckily he rejects Kitty for Anna. Kitty suffers a terrible heartbreak, but ultimately reconciles to her fate and gets married to Levin, who as I said above is slated to become an unsung hero. Would Anna be able to deal with her precarious situation as an illegal wife, would Levin be able to make peace with being the second choice of his beloved wife, and would Vronsky be able to accept the highly agitated, jealous Anna as his life partner, are some of the questions wonderfully dealt with in this novel of destiny, death and human relationships, contradicting the very love, one seeks in a family. I have never read anything like Anna Karenina before, and even though I have just finished reading it, having spent almost a month in the company of larger than life characters of Tolstoy’s magnum opus, I am already feeling a void in my life. Just as we miss our loved ones, when they leave, I am missing the ever questioning Levin, happy go lucky Stephen and grossly misunderstood Anna. The novel is a timeless classic, portraying the ever challenging quest of human beings to change their destiny and their desperate attempts to run away from life. Last but certainly not the least, as I read the English version of Anna Karenina, I think this review would be incomplete without a mention of the commendable job done by translators Louise and Aylmer Maude in the Wordsworth Classics Edition, making the world of Tolstoy alive in a foreign language, while retaining its Russian spirit. I also liked the thoughtful addition of footnotes, explaining the meaning of French phrases often used by Tolstoy in narrative. In short, I absolutely loved this novel despite some philosophical meanderings, and I am looking forward to read this saga of human emotions and domestic strife once again.